Now that her husband, George, is dead, middle-aged homemaker Alice Owens thinks his oppressive reign over her life has ended–but she is wrong. George thwarts her attempts at freedom, mentally and physically, from beyond the grave. Homemaker Alice Owens returns from a routine grocery-shopping trip to find her husband, George, slumped over their kitchen table, as dead as her love for him. Glad her strangled life with him has ended, she prepares for the arrival of her adult children–a daughter who hates her, and a needy son–who will inevitably show up for the funeral. But while cleaning out George’s belongings, Alice stumbles across enigmatic documents linking him to an African-American charity, and a heinous crime committed over thirty years prior. Alice grapples not only with memories of her marriage’s turbulent past, but with murder and infidelity from George’s secret double life pushing themselves into her present. 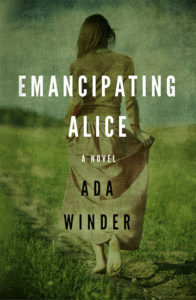 Will Alice finally gain the freedom she’s always desired? Or will George’s secrets take her over the edge? Originally published November 2012, this second edition was released July 2014.